March 18, 2013, 9:59 PM · Turning modern-metal Disney Hall into an intimate setting that feels like a Baroque-era European living room requires some serious magic, but the Canadian period-instrument ensemble Tafelmusik worked its spell last Wednesday in Los Angeles. This was no normal concert -- the show, entitled "House of Dreams," unfolded under a giant gilt frame, where a slideshow of artwork and photography helped transport the listener to five different homes in Europe: the Handel House Museum in London; the Palazzo Smith Mangilli-Valmarana in Venice; the Golden ABC in Delft, Netherlands; the Palais-Royal in Paris, and the Bach Museum and Archive in Leipzig. On the musical side, the 17 members of Tafelmusik, directed by violinist Jeanne Lamon, performed this entire two-hour show from memory, strolling around the stage with the comfort of musicians playing in -- well, their living room! They made it look easy -- it isn't. These musicians have the absolute and complete mastery that allows them to enter the realm of the playful -- and take the audience along. The ensemble includes strings (all period instruments), oboe, bassoon, lute and harpsichord. As is the Baroque way, the violinists and violists play with no shoulder rests. The 20-some musical pieces in "House of Dreams" included movements from works by Handel, Vivaldi, Bach, Telemann, Sweelinck, Purcell and Marais. The spotlight fell on every member at some point: a furiously fast cello duet by Vivaldi played by Christina Mahler and Allen Whear; a bassoon concerto played by Dominic Teresi; an oboe duet featuring John Abberger and Marco Cera and much more. We even got the last movement of the Bach Double, while in the Bach Museum -- they took it at quite a clip, what a ride! A trio sonata played by violinist Tricia Ahern, violist Patrick Jordon and harpsichordist Olivier Fortin was full of color and personality. The show was so seamlessly scripted, it left no room for applause between the various pieces, though it was hard not to clap, especially after the incredible harpsichord solo, Sweelinck's "Engelse Fortuin," played by Fortin. This is not the first time that Tafelmusik has joined its 17th-century aesthetic with 21st-century media technology to create a show that makes its own elegant point. In 2009 Tafelmusik toured with a show called "The Galileo Project," which was released as a DVD in 2012. That show took music by Monteverdi, Vivaldi, Bach and Handel and set it against a backdrop of high-definition images from the Hubble telescope, NASA and Canadian astronomers. For Tafelmusik, Baroque music and period instruments are no gimmick -- they are a means of expression so ingrained, these musicians seem to breathe it. They bring the same attitude to the use of technology and multimedia. It makes no show of itself; it serves the art. Thus the old and the new coexist on stage like two good friends -- friends who improve each other. 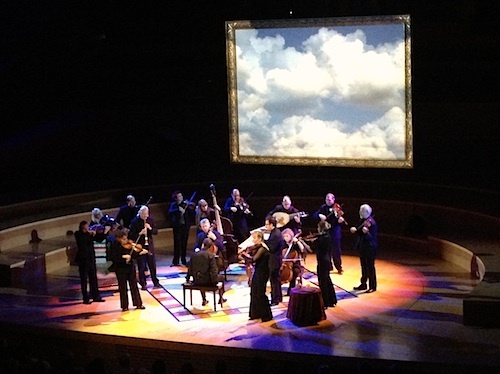 March 21, 2013 at 05:27 PM · I saw Tafelmusik perform The Galileo Project locally a few months ago. It was an evening in heaven. I bought the DVD of their performance, and although nothing could match watching them live (from the third row, no less), the DVD comes as close as you can get. Highly recommended. If you know anyone who might be even remotely interested in baroque music, taking them to a Tafelmusik performance is a sure way to get them hooked.